282 Beacon is located on the NW corner of Beacon and Exeter, with 280 Beacon to the east, across Exeter, 286-288 Beacon to the west, and 299 Beacon to the south, across Beacon. 282 Beacon was designed by Blackall and Elwell, architects, and built in 1927 by Boyle-Robertson Company, builders, as an eleven story, ten unit apartment house. It was built for real estate dealer Elliott Henderson and Roger B. Tyler, trustees of the 282 Beacon Street Trust; Elliott Henderson is shown as the owner on the original building permit application dated November 29, 1926. 282 Beacon replaced two townhouses at 282 and 284 Beacon that were purchased in August and September of 1926 by real estate dealer Henry C. Brookings and then acquired from him on September 10, 1926, by the 282 Beacon Street Trust. Click here for an index to the deeds for 282 Beacon and its predecessor buildings. In a September 20, 1926, Boston Globe article describing plans for the building, it was described as a “cooperative apartment house, to contain every modern improvement…one modern apartment to a floor…”. Plans for the building — including elevations, floor plans, framing plans, piling and foundation plans, and other construction details — are included in the City of Boston Blueprints Collection in the Boston Public Library’s Arts Department (reference BIN N-19). Click here to view the Beacon, Exeter, and River elevations of 282 Beacon. Rodolphe Louis Agassiz. He and his wife, Maria Dallas (Scott) Agassiz. They previously had lived at 135 Commonwealth. He was the former president of the Calumet and Hecla Consolidated Copper Company, founded by his father, Alexander Agassiz. He died in July of 1933, and Maria Agassiz moved soon thereafter. Samuel Eliot Guild and his wife, Jane (Peters) Guild. They had married in February of 1926 and 282 Beacon probably was their first home together. Prior to their marriage, he had lived at 102 Beacon with his parents, Samuel Eliot Guild and Jessie Rodman (Motley) Guild. He was an investment banker. They continued to live at 282 Beacon at the time of his death in October of 1977. Frank Herbert Thayer and his wife, Alice Augusta (Waterman) Thayer. They previously had lived at 452 Beacon. He was a shoe manufacturer with his father’s firm, N. B. Thayer & Co. He died in December of 1929. Alice Thayer continued continued to live at 282 Beacon until her death in May of 1965. Richard Ward and his wife, Alma Gleason (Oswald) Ward. They previously had lived at 190 Beacon. They also maintained a home, Stew Pan, in Swampscott. He was a manufacturer of braid and cotton fabric. They continued to live at 282 Beacon during the 1932-1933 season, but moved thereafter. 282 Beacon remained a cooperative apartment house. 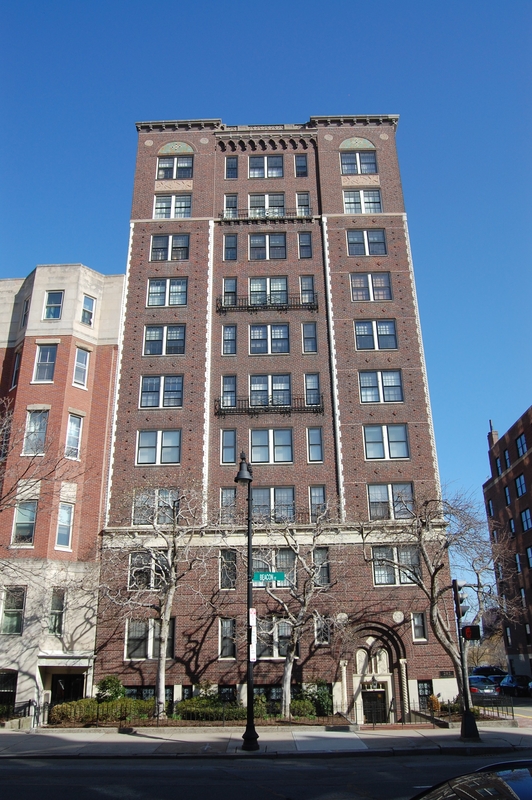 On October 18, 1934, the form of ownership was changed from a trust to a corporation, and the property was transferred from the 282 Beacon Street Trust to Two Eighty Two Beacon Street, Inc. In January of 1940, real estate dealer and manager Gerald Boardman, on behalf of 282 Beacon St. Inc., applied for (and subsequently received) permission to remodel the front entrance of the building. At that time, it was composed of eleven apartments. 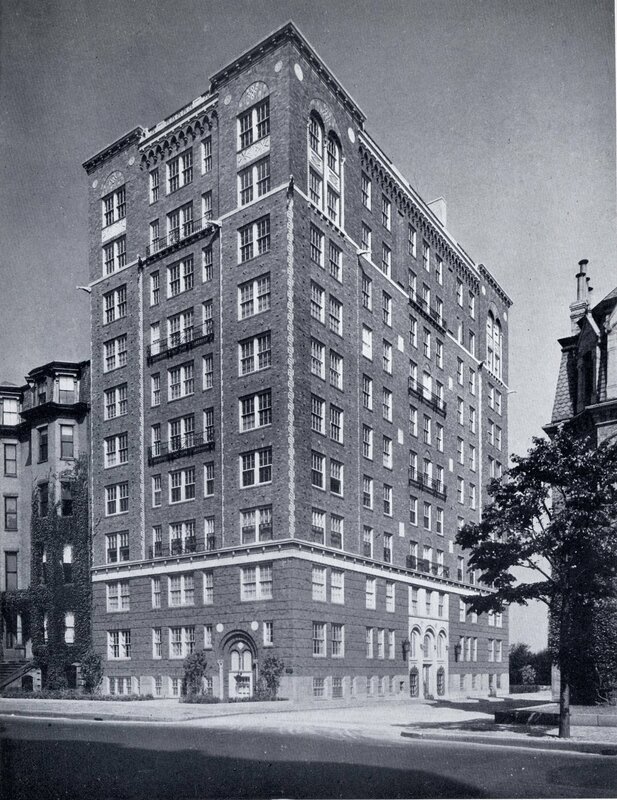 On April 11, 1947, the National Shawmut Bank of Boston foreclosed on its mortgage to the 282 Beacon Street Trust, which had been assumed by 282 Beacon Street, Inc. On May 13, 1947, the property was acquired by Beacon Exeter Apartments, Inc., formed by the residents as a new entity to own the property as a cooperative apartment building. In May of 1973, R. M. Bradley & Co., on behalf of Beacon Exeter Apartments, applied for (and subsequently received) permission to combine two first floor apartments into one, and to legalize the occupancy as eight units. The filing indicates that there was no prior record of the legal occupancy. 282 Beacon remained a cooperative apartment building in 2016. 282 Beacon was built ca. 1872 as the home of retired shipping merchant Caleb Agry Curtis and his wife, Emily M. (Adams) Curtis. In his Houses of Boston’s Back Bay, Bainbridge Bunting indicates that it was designed by Theophilus P. Briggs. Theophilus Briggs was a housewright and carpenter, rather than an architect, and probably also built the house. On a permit application dated June 28, 1872, for a stable to be built behind the house, Theophilus Briggs is shown as both the architect and builder. Caleb Curtis is shown as the owner on the application. 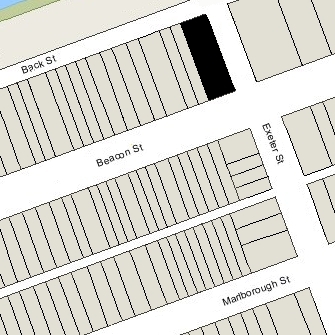 Emily Curtis purchased the land for 282 Beacon on December 6, 1872, from the Boston and Roxbury Mill Corporation. In the early 1880s, the Curtises were living elsewhere, probably traveling abroad. During the 1879-1880 winter season, 282 Beacon was the home of retired flour merchant Edwin Augustus Robinson and his wife, Ellen Caroline (Coburn) Robinson. They previously had lived at the Hotel Cluny at 543 Boylston. Their son, Edward, lived with him; he would later become director of the Museum of Fine Arts in Boston and then of the Metropolitan Museum of Art in New York City. Edwin Robinson died in June of 1880. Ellen Robinson and her son moved soon thereafter. By the 1880-1881 winter season, 282 Beacon was the home of George Nathaniel Dana and his wife, Caroline Melissa (Dodge) Dana. They previously had lived at 486 Columbus. He was a commission merchant and agent for the Eagle Sugar Refinery. They continued to live at 282 Beacon during the 1881-1882 season, but moved thereafter to a new home they had built at 318 Beacon. By the 1882-1883 winter season, Caleb and Emily Curtis were living at 282 Beacon once again. Emily Curtis died in July of 1883. Caleb Curtis continued to live at 282 Beacon with their two daughters, Amy and Clara, until about 1896. By the early 1900s lived in France, where he died in January of 1903. 282 Beacon was not listed in the 1897 Blue Book. On January 28, 1897, 282 Beacon was purchased from Caleb Curtis by Katharine (Lowell) Roosevelt, the widow of Alfred Roosevelt. Alfred Roosevelt had been a banker in New York City and was killed in a railroad accident in July of 1891. She had lived at 234 Beacon during the 1896-1897 winter season. Katharine Roosevelt married again, November of 1902, to Thomas James Bowlker, a professor of mathematics and a scientist. After their marriage, they lived at 282 Beacon. T. James Bowlker died in February of 1917. 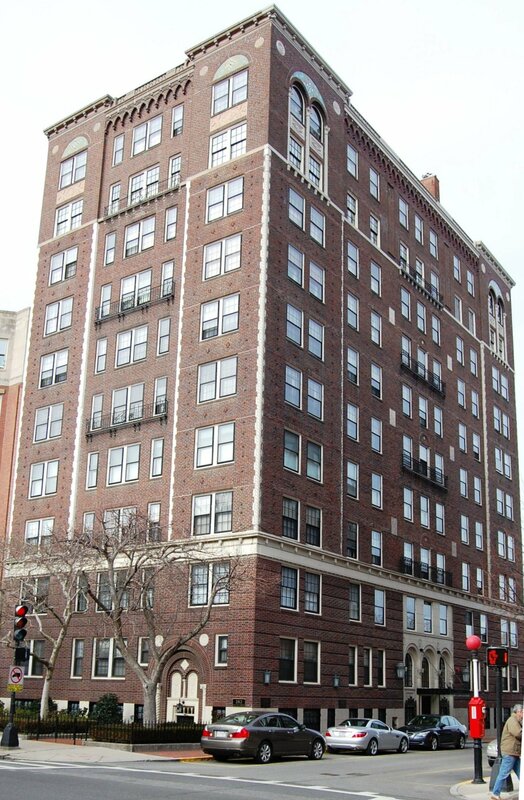 Katharine (Lowell) Bowlker continued to live at 282 Beacon until about 1923, when the Blue Book indicated she was “abroad for the winter.” She had returned by 1925 and was living at the Hotel Vendôme in February when she fell to her death from her fifth floor apartment. At the time of her death, she was president of the Women’s Municipal League. 282 Beacon was not listed in the 1924-1927 Blue Books. On May 28, 1925, 282 Beacon was acquired from Katharine Bowlker’s estate by Lester I. Hartshorne, a trust accountant who lived in Woburn. On September 9, 1926, it was acquired from him by real estate dealer Henry C. Brookings, who had acquired 284 Beacon on August 26, 1926. The next day, Henry Brookings conveyed both properties to Elliott Henderson and Roger B. Tyler, trustees of the 282 Beacon Street Trust. The two houses were razed soon thereafter. 284 Beacon was built in 1870-1871 as the home of William Frederic Matchett, treasurer of the Boston and Roxbury Mill Corporation, and his wife, Sarah Amanda (Livermore) Matchett. They previously had lived in Brighton. Sarah Matchett purchased the land for 284 Beacon on October 6, 1870, from her husband’s company. William Matchett died in January of 1901. Sarah Matchett continued to live at 284 Beacon until about 1905, when she moved to Brookline. On April 25, 1905, 284 Beacon was purchased from Sarah Matchett by wool merchant Lorenzo N. Kettle. He and his wife, Ernestine (May) Kettle, made it their home. They previously had lived at The Kensington (northeast corner of Boylston and Exeter). They also maintained homes in Weston and in Bar Harbor. Lorenzo Kettle died in February of 1910. Ernestine Kettle continued to live at 284 Beacon during the 1915-1916 winter season, but moved thereafter to her homes in Weston and Bar Harbor (she died in Bar Harbor in July of 1918). On June 6, 1916, 284 Beacon was purchased from Lorenzo Kettle’s estate Laura Kate (Colman) Liggett Hill, widow of Hiram Shaw Liggett of the St. Louis tobacco manufacturing firm of Liggett and Myers, and of former Maine Governor John Fremont Hill. Her daughter, Katherine Langdon Hill, lived with her. They previously had lived at 18 Exeter. They continued to live at 284 Beacon during the 1922-1923 winter season, after which they traveled abroad. Katherine Hill married in June of 1925 to John Lee Merrill. 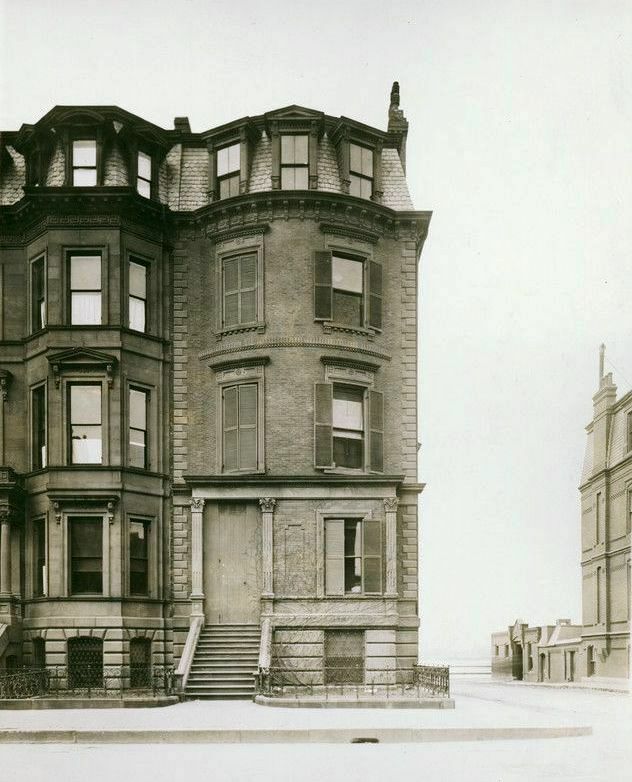 By the 1926-1927 winter season, Laura Hill was living in an apartment at 65 Commonwealth; she continued to live there until about 1939, when she moved to an apartment at 282 Beacon, where she was living at the time of her death in February of 1942. On February 13, 1923, 284 Beacon was purchased from Laura Hill by Bertha (Glover) Rueter, the widow of Henry Arnold Rueter, as her home and the home of her son and daughter-in-law, William Glover Rueter and Margaret (Margot) Putnam (Cushing) Rueter. Bertha Rueter previously had lived at 119 Perkins in Jamaica Plain with her husband, who died in November of 1922. William and Margaret Rueter had lived at 160 Riverway. William Rueter was a brewer in his family’s business. They continued to live at 284 Beacon during the 1925-1926 winter season, but moved thereafter to 10 Fairfield. On August 26, 1926, 284 Beacon was acquired from Bertha Rueter by real estate dealer Henry C. Brookings. On September 9, 1926. he acquired 282 Beacon, and the next day he conveyed both properties to Elliott Henderson and Roger B. Tyler, trustees of the 282 Beacon Street Trust. The two houses were razed soon thereafter.